A consultation meeting was held in Istanbul on May 10, organized jointly by the International Investors Association YASED and the Ministry of Energy and Natural Resources. 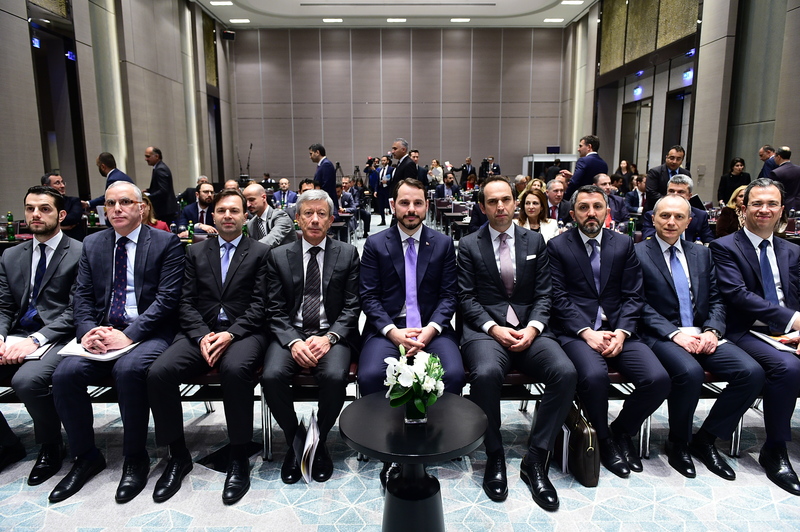 The meeting, where sustainable economic growth and the investment/business environment were evaluated, with the attendance of the Minister of Energy and Natural Resources Berat Albayrak, YASED Chairman Ahmet Erdem and top executives of YASED member firms. During his speech at the meeting, YASED Chairman Ahmet Erdem emphasized the importance of international direct investments in the sustainable growth and development of Turkey, further pointing out that international investments play a crucial role in increasing value-added export volume and the improvement of the country’s competitive position as a regional investment hub, which rank among our most important goals. Erdem stated that, for the development of the country, it is more important than ever that Turkey prioritize policies that will attract international direct investments and spoke as follows: “We consider international direct investments highly critical for Turkey’s sustainable growth and development, and are voicing this opinion at every opportunity. The role and strategic contribution of international direct investments in increasing high-technology, value-added manufacturing and exports, enhancing R&D and innovation capacity, and extending the reach of digital transformation in industry are irrefutable. In addition, international investments play a major role in improving our competitiveness as a regional investment hub. With all this in mind, emphasizing policies that will increase international direct investments is more important than ever for the development of our country”. Erdem reminded listeners that Turkey, in line with its economic growth over the last 15 years, experienced one of the greatest increases in energy demand. The national mine and energy strategy set forth by the Energy Minister last year, he said, was key in meeting this demand in the safest and most economical manner. Erdem also stressed that among the mergers and acquisitions that took place in Turkey between 2010 and 2017, the energy sector was among the top attractors of international direct investment. He further stated: “During 2017, the energy sector had a 36% share in international direct investments, making it the third most popular sector. Growing 40% compared to the prior year, the sector pulled in around one billion dollars in new international investment in 2017. This figure does not include new investments by existing firms, and with those added to the total, the figure would be far higher still”. During his speech at the meeting, Berat Albayrak, the Minister of Energy and Natural Resources, stated as follows: “Turkey has undergone a major process of change and restoration in various ways over the last 16 years. During this period, the Turkish economy got rid of old baggage and experienced a period of speedy recovery. Without a doubt, three major factors lie at the heart of our economic success: stability, strong leadership and trust. As a result, the Turkish economy grew three-and-a-half fold. We broke a world record with double-digit growth and have surpassed European Union and OECD nations with our growth rate. Local and international investments grew exponentially every year. Total international direct investment between 2002 and 2017 surpassed 200 billion dollars”. Turkey, as an attractive target for investments, continues to pull in investments from all regions of the world, be it the far east or the far west, said Albayrak, and added that the energy sector is a locomotive of this trend. Albayrak stated that with its growing economy, Turkey offers great opportunities for investors and continued as follows: “In the midst of global trade wars, Turkey continues to be a safe harbor for investors. We have always stressed that those who invested in Turkey have never lost and will not lose. With our geopolitical advantage, we offer access to more than 2 billion consumers in 50 countries and a market of 25 trillion dollars, with a two-hour flight. With our liberal, open-minded and competitive economic environment, we promise companies greater profitability. We enable the fastest possible access to target markets, thanks to our advanced infrastructure in transportation, energy, logistics and the environment. Recently, our president announced a super-incentive package, where almost half of the projects that will be implemented will be in the field of energy. The ultimate goal of those projects, totaling 135 billion Turkish Lira, is to support the technology-oriented transformation of the economy and contribute to our economy with R&D intensive and innovative investments. Energy and mining have become the new stars of the investment world, and I sincerely believe that this trend will continue during the upcoming period. We will thus prioritize technology transfer, R&D and local manufacturing in our investments. I would like to repeat what I have stated so many times in the past: From our perspective, any firm that has invested in Turkey, regardless of its origin, is a Turkish firm. We have managed to create a wonderful synergy in this regard within the energy sector”.